Our eyes go through plenty of obstacles each day. Stress, lights, and technology can all have a huge impact on our eye health, and it shows. Strained and irritated eyes, dark circles, and sensitivity are just a few side effects that can cause major pain and many other health problems. While it might seem like you just have to go along with this, you don’t. One way you can beat these problems is by using eye massagers. This article will explain more behind what these helpful devices are, how they can help you, and some of the top picks you can use so you get relief from eye pain. 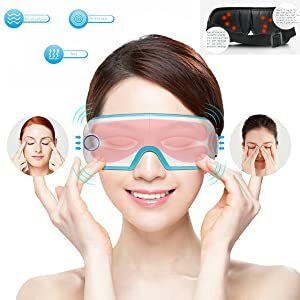 Eye massagers are a unique device that help to remove dark circles under your eyes and relieve strain and tension in them. In other words, they pretty much help to rejuvenate your eyes to help them feel and look better. Most eye massagers look like a helmet or thick sunglasses which you put and secure over your eyes. You can then turn your eye massager on and sit back and relax as the device gets to work massaging the areas around them. At first glance, it might not seem like eye massagers are that difficult to use, and they’re not. But the science that created them is extremely intricate. They were created with the intention of pinpointing the different pressure points in your head that can cause strain and tension in your eyes. The massagers block out any source of light and get to work on these points using various methods like heat and air pressure. Eventually, after a few times of using it, you’ll find that the massages will help to reduce problems in these areas and even prevent them from constantly occurring. The beginning of this article mentioned some of the main benefits you can get from using these devices like reducing eye pain and dark circles that form under your eyes. If you’re still not convinced, there are a few other benefits you’ll find they offer as well. Because eye massagers work to help massage pressure points around your face, they can help to reduce headaches in this way as well. With the different massage modes built into them, you’ll find that it will help to soothe the pain caused by headaches and massage the areas that often are the source of headaches to help heal them quickly. While it might seem like these devices don’t have many options when it comes to massage, they actually do. Many models often come with 3-5 different types of massages you can use, like heat compression and vibrations, to help cater to your specific needs. You can usually alternate between the different types to make the perfect massage routine for your body. A majority of these devices tend to come with music therapy. This can either come with its built-in sounds, like ocean waves, or by connecting to Bluetooth so you can listen to your own music. Music therapy can help to reduce tension and keep you calm and relaxed when wearing the eye massager. Many similar types of devices are often bulky and take up much space which can dissuade many from investing in them. However, with eye massagers you don’t have to worry about this. These products can be folded in half when you’re done using them which can help to save space and from them accidentally being damaged. Another excellent thing about eye massagers is that they are durable and comfortable. If you accidentally bump them against something, you won’t have to worry about them cracking easily. They are made to last thanks to their hard protective shell. In addition to this, they’re also very comfortable to wear due to the soft padding that lines the area where it rests on your face. This padding acts as a pillow and will make wearing the eye massager very calming. This Breo eye massager is made with a sleek white and blue design that slides comfortably over your eyes to help relieve them of pain. You can use the strap attached to the front cover to help keep it snug on your face. 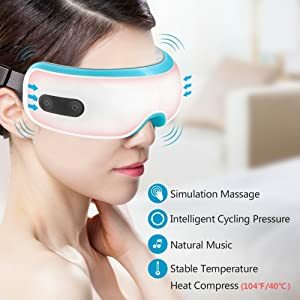 You can then turn the eye massager on where it will get to work giving your eyes and face a simulation massage as well as cycling pressure, a heat compress that can go up to a high temperature of 104oF, and even the ability to play soothing music while you wear it. This massager has three different modes you can choose from and comes with a rechargeable battery and charger. This compact device also comes with a travel bag you can store it in if you’d like to use it while on the go. 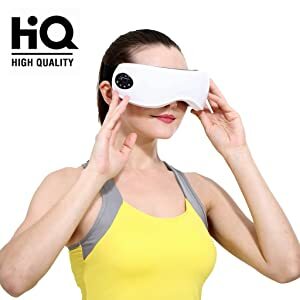 The Aerobic Exercise Eye Massager is an affordable model that features five different massage types to help keep you calm and reduce any eye pain you might be having. These massage types include far-infrared heat, air pressure massage, soothing vibrations, and even music therapy. This cordless model fits snuggly over your eyes and can be adjusted with the buttons set around the edge of this device. This futuristic-looking electric eye massager by Selenechen is a great way to help reduce swelling under your eyes or strain you might have in them. To use this device, simply slide it over your head and secure it with the strap attached to it. There is a padding inside where your eyes are so your head won’t press against any uncomfortable parts of the massager. You can then press the buttons on the side to turn it on and start your massage. You’ll find that there are different massage modes you can choose from: air pressure, vibration, heat, and music therapy. This wireless model can go up to a soothing temperature of 104oF to help give you relief faster which can be very helpful in many situations. If you choose to use the music therapy option, you can connect this device to Bluetooth so you can make your own playlist for it. You can use this massager for up to 15 minutes at a time. When it comes time to recharge its battery, you can take the charger it comes with which will get to work quickly filling up the battery (it takes about 2 hours for a full charge) so you can use it again. The Baiyea Eye Massager is an affordable model that comes with many helpful features so your eyes stay relaxed and soothed. It comes with three different massage modes you can use: air pressure, vibration, and heat. It also comes with various modes you can use to make unique massage technique patterns. For instance, with the automatic mode you’ll find that it will change through each massage mode type every minute for up to eight minutes. There’s even a beauty mode which will activate the heat massage and have it run for 15 minutes so it gets to work quickly removing dark circles under your eyes. 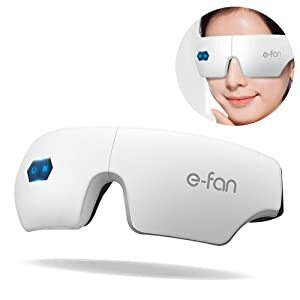 This eye massager comes with a soft padding on the inside of it to help keep your forehead comfortable and secure when you wear this device as well as an adjustable strap you can use to help keep the device snug on your head. When you’re done using it, you can fold it in half thanks to its unique design and store it away in the storage bag it comes with until you need to use it again. The HaloVa Wireless Eye Massager is made with a compact design and is a simple option which makes it perfect for those who don’t want an eye massager that’s too technical. It features three different massage modes you can use, all of which can be switched through with the button located on the side of this device. If you choose to use the heat therapy option, you have the ability to mute the humming of the massager as it uses the heat compression to help make the experience more relaxing. The massager can be folded in half thanks to its 180-degree fold design so you can easily carry it around and store it away without problems. 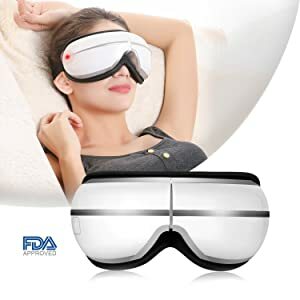 The REAK Eye Massager features a stylish white and black design and comes with a few different massage modes you can choose from like heat compression and vibration massage. The massage modes, once turned on, will run for 15 minutes at a time until it automatically turns itself off. 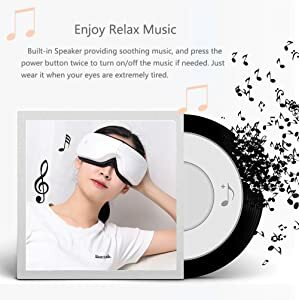 In addition to this, the REAK Eye Massager also has a built-in speaker which enables you to listen to music (like ocean waves and singing birds) when you use the massager on your eyes. It comes with a rechargeable battery and charger and can be folded in half to help save space when you’re done using it. This affordable model takes about two hours for a full charge and will run for about two to three hours on a full battery. 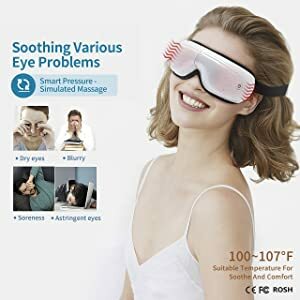 This eye massager is a comfortable device made with a soft padding around the edges that will help to keep you relaxed when you’re wearing it. The massager has about four different massage modes you can use: air pressure, far-infrared, vibration, and even music therapy. All of these modes will work to help reduce dark circles under your eyes, improve blood circulation around them, and help to heal strained eyes. This wireless model comes with a rechargeable battery so you don’t have to worry about investing in batteries for it. The IRealist Eye Massager works quickly making it perfect for those who want to have instant results to use. The Guisee Eye Massager features a comfortable design with its plush padding and soothing massage modes. This device comes with four built-in massage modes, like air pressure and heat compression, you can use to help relieve tension and other issues in your eyes and face. It’s also able to support MP3 music downloads so you can listen to music while wearing it. You can adjust these different settings with the buttons located conveniently on the side of the massager. The device comes with an adjustable strap so you can secure it to your face to prevent it from slipping. When you’re done using it, you can fold it in half and place it in the storage bag it comes with. This affordable model also comes with a charger so you can recharge the battery when necessary. 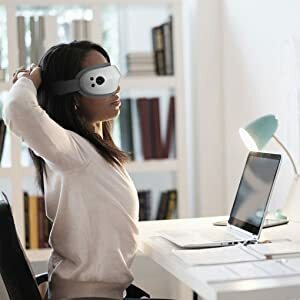 Sit back and relax with the Osito Eye Massager as it gets to work quickly, but softly, helping to reduce pain in your eyes and the surrounding areas. 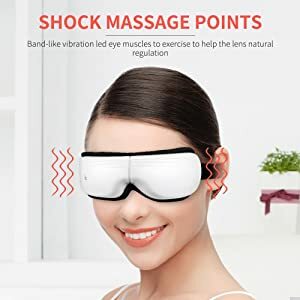 This eye massager features a few different massage functions, like the acupoint massage which works to address the optic nerves around your eyes that cause tension in them. There’s also a vibration mode that has 15 different types of vibrating rhythms you can use on your face. If you want to listen to music while wearing it, you can thanks to the music therapy built into it. You’ll be able to choose from three different soothing sounds that can help to calm you, and maybe even lull you to sleep. This stylish model is easy to use and comes at an affordable price making it perfect for those on a budget. 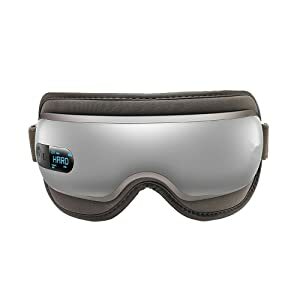 The Bromose Eye Massager features over five different massaging modes that get to work quickly helping your eyes heal. It has a special recycle air massage feature that helps to create heat compression (up to 104 o F) and even vibrating motions. The eye massager also includes built-in music therapy which plays tranquil music while you’re wearing it. The protective shell on its exterior helps to prevent damages to the massager and can be folded in half when you’re done using it thanks to its 180-degree folded design. It also uses a rechargeable battery so you don’t need to worry about buying extra ones to use it. A charger also comes with it which you can use to power the battery back up when necessary. Eye massagers are great ways to help reduce stress, tension, and strain in your eyes. They can even help to make dark circles and puffiness under your eyes completely vanish. With all of these benefits, you can be sure that they’ll be able to get to work quickly helping you. The models mentioned above are some of the top choices to consider using because they work well and are designed with various adjustable features that will cater to different needs. If you’re looking to help improve your eye health or even give yourself relief from headaches, definitely consider investing in one of these devices.